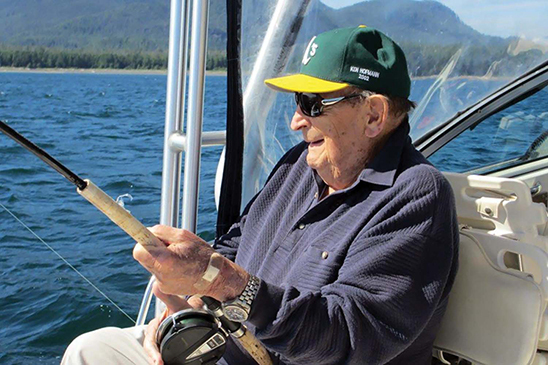 Ken Hofmann passed away peacefully at age 95 at his home in California with his family by his side. Ken deserves wide recognition and appreciation. He was one of the original board members of The National Fish and Wildlife Foundation, appointed by President Reagan, and in my humble opinion the most influential both for NFWF and for my own career and philosophy. How do you raise money for a start up foundation without a dime in the bank? Ken knew the answer, leverage every dollar raised. He was the most generous of all the original board members with contributions that put NFWF on a path of both solvency and annually progressive grant making. Once we had a few hundred thousand dollars in the bank we set up an account with Fayez Sarafim in Houston. Ken set up a duplicate account of his own to monitor all of Fayez’s investments for the foundation to track NFWF fund performance. When the time came to consider upgrading our financial vice president , Ken insisted on an expeditious change of personnel. However his most influential role was opening the door of NFWF’s grant making to embrace working with private land owners on conservation, particularly on wetlands in California. Ken Hofmann was the propulsion engine behind turning rice farmers in the Central Valley into one of the most important pillars of waterfowl conservation. Ken was enormously influential in focusing my thinking on how to engage private land owners. He was an early and life-long supporter of the North American Waterfowl Management plan (NAWCA today) and supported projects across the US, from California , to Texas and Louisiana to South Carolina’s ACE Basin. Ken resigned from NFWF during my tenure as Executive Director, and I lost track of him for over 15 years. Three falls ago his Sancho Panza, Claude Grillo, called and invited me to join Ken for a duck hunt at Rancho Esquon over Halloween in October, 2015. We had a dinner with John Chambers and a couple hours of conversation. It was a priceless reconnect. NFWF today would not be the organization it is without Ken Hofmann’ leadership on fundraising, financial management and grant making. He was an Hercules for conservation and a critical, perhaps the most critical, board personage involved in crafting the infant NFWF foundation to what it has become today. I miss Ken Hofmann, and I am glad he switched horses from being a pugilist to a duck hunter. Conservationists across California and the nation owe thanks to Ken Hofmann. Obviously Ken was very influential in my own thinking of how to build private land conservation programs. During my latter years at NFWF I gave grants to create California Rangeland Trust, Colorado Cattlemans Ag Land Trust and Texas Ag Land Trust, and multiple grants to the Malpais Borderlands Group, and a number of grants to rice growers in multiple states. We also initiated NFWF grants to start USFWS Partners for wildlife Program. Ken’s shadow hangs over all those grants and my current foundation , Land Conservation Assistance Network, LandCAN.